Wilkes University returns home to Schmidt Stadium following its bye week. The Colonels are coming off of a 62-9 loss at #20 Albright. The Flying Dutchmen coming off of a 56-14 home win against FDU-Florham on October 10th. Colonels coach Trey Brown (Colorado ‘93) enters his second year at the helm of the program in 2015. Brown comes to Wilkes after four years serving as the quarterbacks and special teams’ coordinator at Muhlenberg. In his role with the Mules, Brown was responsible for coaching the quarterbacks, wide receivers, and special teams as well as the installation of the pass game. Prior to his time at Muhlenberg, Brown spent four seasons as offensive coordinator and quarterbacks coach at Lehigh University. The Mountain Hawk offense scored 30 or more points 15 times during his tenure and led the Patriot League in scoring in 2006, when its quarterback was named to the All-Patriot League first team. Brown coordinated an offense that averaged 32.3 points in league games in 2008 and 27.3 points in 2009. Lehigh scored more than 80 percent of the time it reached the Red Zone both seasons, including a Patriot League-best 87.9-percent efficiency in 2008. Jim Monos (Shippensburg ‘72) is in his 23rd season as the head coach of the Flying Dutchmen. Prior to taking over at Lebanon Valley, Monos served as the offensive coordinator and quarterbacks coach at Division II Bloomsburg, and as the offensive coordinator at DII Shippensburg. Monos has also coached three All-Americans at LVC, and was named the MAC co-Coach of the Year in 1989. This will be the 44th meeting between the two schools, as Wilkes holds a 23-20 lead in the series. LVC has taken the last four contests, with the last Colonels win coming in 2010 in overtime 35-28 in Annville, Pa. The Colonels will next face Stevenson University at Schmidt Stadium on Saturday at 12 p.m. This will be the fourth meeting between the two schools, with Wilkes holding a 3-1 lead in the series. The Colonels fell at Stevenson last year by a 33-14 final. 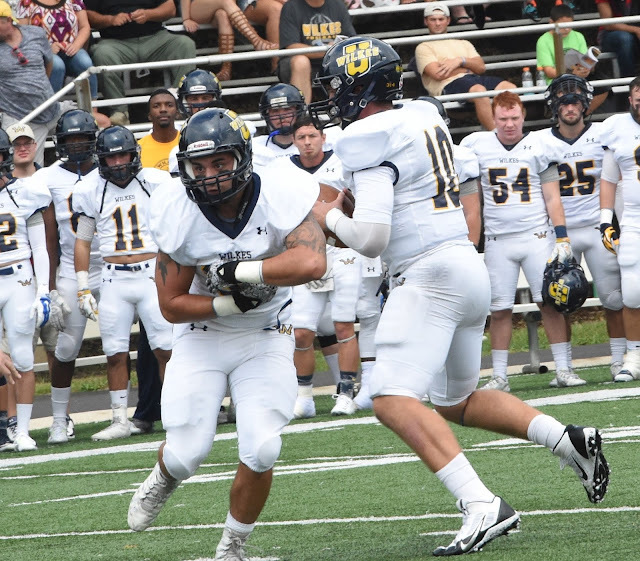 Wilkes is ninth in the MAC in scoring offense (14.2), seventh in total offense (328.8), tenth in rushing offense (83.5) and second in passing offense (245.3). Ryan Dailey finished at Albright 16-for-38 for 124 yards, snapping his streak of five consecutive games of at least 220 yards passing. Dailey’ currently stands with 3,648 career yards and only 139 yards away from Rob Johnson ‘10 (3,787) for sixth on the list. Dailey ranks second in the MAC in passing yards per-game with 244.8 while standing first in attempts (267) and completions (157). His seven touchdown passes rank second in the league, while his 58.8 completion percentage ranks third. PJ Incremona leads the Colonels ground attack standing eighth in the league with an average of 59.4 yards per game. William Deemer, the team’s top receiver, ranks fourth in the league with 34 receptions, and is eighth in the MAC with an average of 56.0 yards per game. Aaron Coyne has scored four touchdowns ranking second in the MAC for all receivers. Wilkes is eighth in the MAC in scoring defense (34.7), ninth in total defense (440.2), seventh in rushing defense (178.0) and tenth in passing defense (262.2). The Colonel defense had five sacks against the Lions led by junior DE Mike Fitz’s two, and freshman LB Jordan Stiles forced a turnover for the second week in a row. Linebacker Tanner Stengel leads the league with 11.7 tackles per game and ranks third with 7.5 tackles for loss. Isaiah Robinson and Jared Powell pace the secondary, as Robinson has 37 tackles, 4.5 for loss, two pass breakups, and one interception, and Powell has 34 stops, 1.0 for loss, six breakups, and one interception. Lebanon Valley ranks second the MAC in scoring offense (33.7), third in total offense (414.0), second in rushing offense (265.8) and eighth in passing offense (148.2). The ground game is led by Brendon Irving, who ranks first in the MAC with 136.0 yards per game and ranks fifth with four touchdowns. Quarterback Tim Pirrone averages 84.7 yards passing per game. His primary target has been Travis Saylor, who ranks 19th in the league with 18 catches and is 11th with 306 yards, while averaging 51.0 yards per game, good for twelfth in the league. LVC is fifth in the MAC in scoring defense (24.2), sixth in total defense (383.0), sixth in rushing defense (164.5) and eighth in passing defense (218.5). Trevor St. Clair has paced the defense, as he is tops on the team with 42 total tackles including 30 solo stops. He also has claimed 6.5 tackles for loss on the season, 3.5 sacks, three interceptions, two pass break ups, one forced fumble and one fumble recovery.